Title insurance is a very simple but little understood part of the real estate finance process. Home buyers are advised to work with a trusted attorney throughout the process of financing and purchasing real estate. Recently, a number of inaccurate and incomplete statements have been promulgated about the title insurance product, title insurance professionals and the regulatory framework that controls the title insurance industry and provides consumer protection. 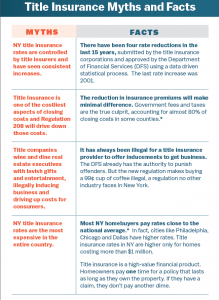 On this page, you will find a document that dispels many of the myths about title insurance. 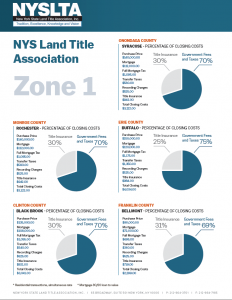 We provide snapshots of residential closing costs from 10 New York State counties. 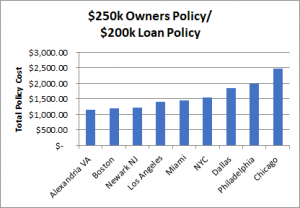 Comparing title insurance premiums in different states is problematic because policy coverage differs from state to state. Different state laws and business practices further complicate direct cost comparisons. Most title agents and title insurance corporations provide “rate calculators” which enable consumers to preview approximate insurance premium costs. While rates are comparable, not all companies offer the same rate and not all companies have the same degree of financial stability and resources. This page and other pages on this web site provide information to support comparative shopping and enable an informed appreciation of title insurance as a financial product that will protect ownership rights for as long as the owner possesses title.